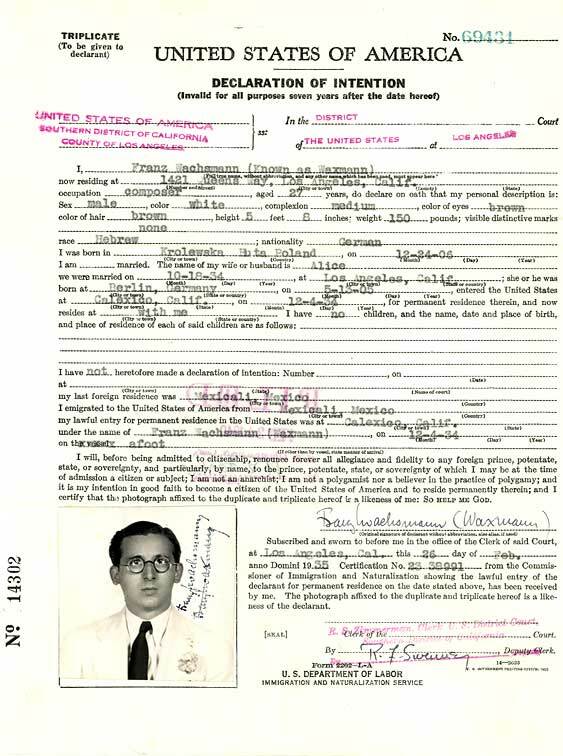 Photo from Waxman’s application for U.S. citizenship. Click to see the application. Franz Waxman led a variety of musical lives as composer, conductor and impresario. He was born in Konigshutte, Upper Silesia, Germany, on December 24, 1906, and was the youngest of six children. No one in the family was musical except Franz, who started piano lessons at the age of seven. His father was an industrialist, and not believing his son could earn a living in music, encouraged him in a banking career. He worked for two and a half years as a teller and used his salary to pay for lessons in piano, harmony and composition. He then quit the bank and moved to Dresden and then to Berlin to study music. During this period he paid for his musical education by playing piano in nightclubs and with the Weintraub Syncopaters, a popular jazz band of the late 1920s. While with the band he began to do their arrangements, and this led to orchestrating some early German musical films. Frederick Hollander, who had written some music for the Weintraubs, gave Waxman his first important movie assignment: orchestrating and conducting Hollander’s score for Josef von Sternberg’s classic film, “The Blue Angel.” The film’s producer, Erich Pommer, who was also head of the UFA Studios in Berlin, was so pleased with the orchestration of the score that he gave Waxman his first major composing assignment: Fritz Lang’s version of “Liliom” (1933) which was filmed in Paris after their exodus from Germany. Pommer’s next assignment, Jerome Kern’s “Music in the Air” (Fox Films, 1934), took him to the United States, and he brought Waxman with him to arrange the music. Two years after he went to Hollywood, Waxman, then 30, signed a seven-year contract with Metro-Goldwyn-Mayer to compose. He averaged about seven pictures a year, and it was during this period that he scored such famous Spencer Tracy films as “Captains Courageous,” “Dr. Jekyll and Mr. Hyde” and “Woman of the Year.” In 1937, he was loaned by M-G-M to David O. Selznick for “The Young at Heart” and was nominated for both Best Original Music and Best Score – the first two of 12 Academy Award nominations he was to receive for the 144 films he scored in his 32 years in Hollywood. In 1940 he was again loaned to Selznick, this time for “Rebecca,” and was nominated for his third Academy Award. In 1947 Waxman founded the Los Angeles International Music Festival, which he was to head for 20 years. World and American premieres of 80 major works by composers such as Stravinsky, Walton, Vaughan Williams, Shostakovitch and Schoenberg were given at the festival. Waxman won the Academy Award in 1950 for Billy Wilder’s “Sunset Boulevard” and in 1951 for George Stevens’ “A Place in the Sun.” For over half a century, he was the only composer to have won the award for Best Score in two successive years. It was during the ’50s and ’60s that he composed some of his most important and varied scores. These are represented by the above two Academy Award winners as well as by “Prince Valiant” and “Taras Bulba.” He had usually been associated with romantic films, but now he progressed to epic and jazz-oriented scores. “Crime in the Streets,” “The Spirit of St. Louis,” “Sayonara,” “Peyton Place” and “The Nun’s Story” are also from this period and the complete scores were issued on soundtrack albums. 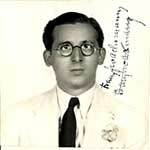 Franz Waxman received many honors during his lifetime, including the Cross of Merit from the Federal Republic of West Germany, honorary memberships in the Mahler Society and the International Society of Arts and Letters, and an honorary doctorate of letters and humanities from Columbia College. He died February 24, 1967, in Los Angeles at the age of 60. Together with Erich Wolfgang Korngold, Max Steiner, Dimitri Tiomkin, Bernard Herrmann and Alfred Newman a United States postage stamp was issued in 1999. During the recent Waxman centenary a street in his birthplace was named Franz Waxmanstrasse. The Academy of Motion Picture Arts & Sciences and Turner Classic Movies held tributes. The Museum of Modern Art in New York presented a 24 picture retrospective; this was the first time that MoMA honored a composer. The Chicago Symphony Orchestra recently performed the complete score THE BRIDE OF FRANKENSTEIN live to film. Major support for this program provided by the National Endowment for the Humanities, The Skirball Foundation, Public Broadcasting Service, The Winston Foundation, Dorothy and Lewis B. Cullman, The Lemberg Foundation and the National Endowment for the Arts. Additional support for this program provided by Agnes Gund and Daniel Shapiro, The Vital Projects Fund, New Line Cinema, Elaine and Alan G. Weiler, The Karma Foundation, Rosalind P. Walter, S. E. Canning, The Max and Victoria Dreyfus Foundation, Alan Harper, Mr. and Mrs. Henry H. Arnhold, Leila and Melville Straus, the Feuchtwanger Institute and public television viewers.